When a standard window won’t do, try creating a dramatic view with a bow or bay window replacement. A bay window typically has a fixed middle window, with side windows that open. Bow windows are usually four or more windows joined together to create a curve, where all the windows may have the ability to open in some way. These windows have a natural, yet elegant curve that adds light and space to a room, creating a larger view. You’ll find a variety of bow and bay window styles that are custom made for a perfect fit. Bring the outside in with replacement bow windows and bay windows. 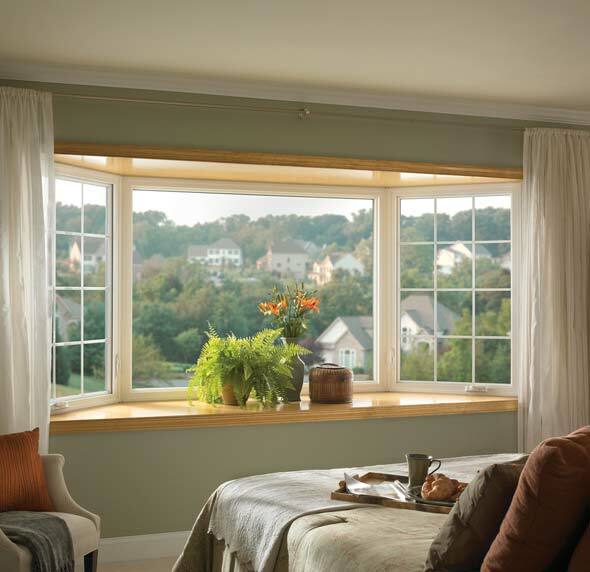 Our energy-efficient vinyl bay windows help reduce your energy bills while making your home more comfortable year-round. It’s the result of fusion-welded multi-chambered vinyl frames, high performance insulated glass units, state-of-the-art manufacturing processes and stringent quality standards. Grilles recreate the look of traditional windowpanes and come in a variety of patterns. For a traditional look, add our Colonial pattern grilles to your bay windows or our Classic Diamond pattern adds authenticity to Tudor home styles. Most Great Lakes vinyl replacement windows are available with grilles-between-glass or simulated divided lites (on the outside of the glass). Our bay windows come with various insulated glass options. Double and triple pane units are available with Low-E coatings suitable for any climate. Improve the thermal performance of your replacement bay windows when you combine double-glazing with argon and Low-E. For ultimate performance in cold climates, consider upgrading to triple-glazed units with krypton and Low-E.